Washer Toss, also known as Washer Pitching, involves teams of players taking turns tossing washers at the target. The object of the gams is to earn points by tossing the wasthers into the box or into the pipe in the center for extra points. 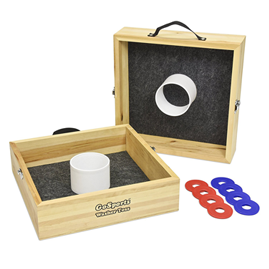 This washer toss set connects the targets together for easier carrying.